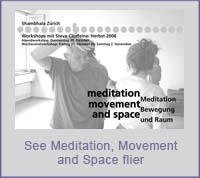 We begin with the powerful tools of expressive movement: stillness, silence and space. From that foundation, we investigate the contrast between the empty space and the qualities that our activities project onto it as we dance, act, and tell stories. Our improvisation practice works with six energies: space, time, kinesthetic, relationship, image, and story. These energies and the dynamics that arise from their interplay inform the choices we make as improvisers - our entrances, exits; beginning, middle, and end. How can we be ourselves in the moment and embody what we want to communicate? How does composition interact with our awareness of the shifting ground of improvisation? We will practice with forms which define and sharpen our relationship to space and to each other: solos, duets, trios, and group work in sound, movement, and text. Our work focuses on being and doing, exploring our natural strengths, doubts, attractions, and inhibitions. I think of improvisation as fieldwork, an open laboratory for expressive communication; a heightened awareness that develops and shifts with natural grace.